England Amir Khan Thursday visited drought hit Thar alongwith his wife Faryal Makhdoom Khan. he had heard of number of deaths of the kids in the desert due to the malnutrition and the outbreak of the diseases. in every village of the desert to avoid more fatalities among the children and the pregnant women adding he urged Tharis to send their children to schools. 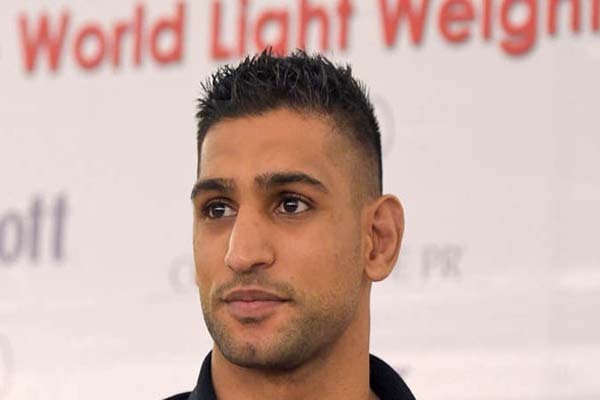 He said that Amir Khan Foundation would raise more funds to ensure more facilities to Tharis. hospitality is unmatched despite living under very miserable conditions. there was dire need that every Pakistani should come forward to help Tharis in their difficult times. of the desert from his foundation. He also urged the government to make more sincere and concerted efforts to mitigate the unending miseries of Tharis and give them much more facilities of healthcare, education, drinking water and education, which he observed was their basic right like every citizen. happy to be there among Tharis, who he said besides facing the droughts and leading the different lives but were very simple and peaceful people. He vowed to frequent visit Thar to mitigate sufferings of the people. live a happy and healthy life. see the rich culture and the historical places and help the local people. facilities in the area adding he observed there was lot to be done. Additional Deputy Commissioner Thar, Mohammad Hussain Baloch, who was accompanied with boxer, told APP that Amir had promised to help government in its efforts to give maximum facilities in Thar region. famous persons like Amir Khan visited here. DC Tharparkar. Dr. Shahzad Tahir Thaheem had earlier received him on his arrival in Mithi and briefed him about the desert area.